Happy 2018! No doubt that goal setting has been on your mind for this New Year. This latest session gives you 5 quick and helpful do’s and don’ts when it comes to goal setting so that you can accomplish what you want this year. Step to Success: A step to your success is anything that moves your life and your business forward. Whether it’s an app, a book or an idea, you can apply something today that can help you succeed. Today’s step to success is an easy to use app to create engaging, animated posts for Instagram called Ripl. 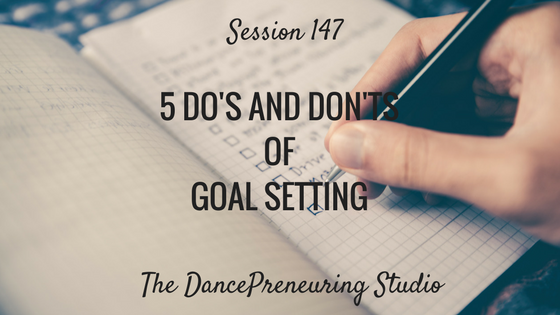 Feature Presentation: I share 5 do’s and don’ts of goal setting that can help you approach this sometimes daunting task. It’s all about finding what works best for you. 1. Do ask yourself why the goals are important to you. 2. Don’t allow yourself to get overwhelmed the techniques, tools, people, software, etc that are available in the goal setting process. Thank you Tom Tate for your article on Quarterly Theming as an alternative option to resolutions. 3. Do allow yourself to indulge in the emotions of achieving these goals. Make it as sensory as possible. 4. Don’t share goals with people that don’t directly affect the outcome.